Erin Ver Hage is a recent graduate from California State University, Monterey Bay. 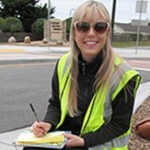 Since 2011, she has assisted Save The Whales throughout the Monterey Bay area with educational outreach, storm drain emblem application, water monitoring of storm drain outfalls, and data entry. Upon graduation, Erin has focused on GIS mapping as a tool to assist local cities and the County of Monterey with updating information on their storm drain inlets and outfalls, and whether the inlets have been marked with educational emblems with the message “No Dumping Flows To Bay.” Erin’s passion for community outreach, GIS, and marine protection aligns with her passion to protect the oceans.